Benefit Concert : Save the Date - Mar 29th 2012! 이노비 기금마련 음악회는 스탭과 보드, 그리고 후원자님들이 한자리에 모여 음악회를 즐기고, 서로 얼굴을 대하고 친분도 나누면서, 이노비의 가치와 비전을 함께 공유하는 시간입니다. 이번 benefit concert는 jazz pianist 송영주님의 무대로 꾸며집니다. 3월 29일 많이 기대해 주세요. We at EnoB would like to invite all of our supporters and volunteers, those who have helped with their time and talents, and those who are just beginning to learn about us, to our first benefit concert of the year. Through this benefit concert, we would like to gather everyone together to enjoy beautiful music and get to know one another, while sharing our vision for EnoB. 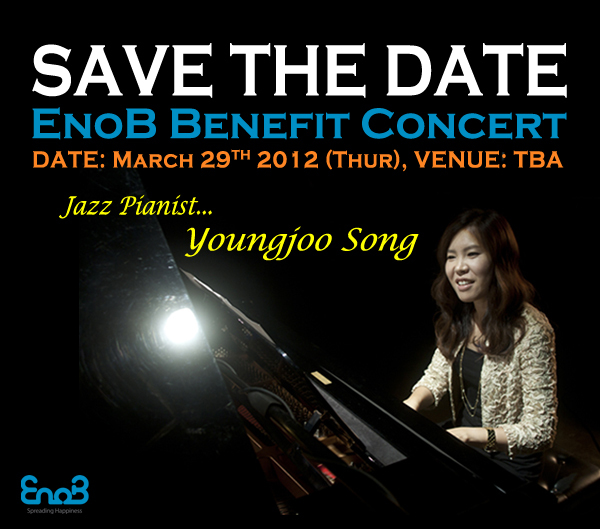 This first benefit concert of the year, slated for March 29th, will feature YoungJoo Song, one of Korea's leading jazz pianists. More information about this concert will be announced shortly. 이번 EnoB 베네핏 콘서트의 주인공이자 이노비의 뮤직디렉터이신 재즈피아니스트 송영주님을 소개합니다. 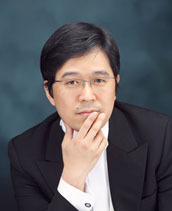 Young Joo Song is one of Korea's leading jazz pianists. Ms. Song has recorded prolifically, releasing 8 albums with distinguished labels such as EMI, Warner Music, and Sony Music. In 2010, her album "Love Never Fails" won "Best Jazz Album" at the Korean Music awards. She was also nominated in the same category for "Free to Fly" in 2009, and "Tale of a city" in 2011. Ms. Song aspires to reach as many hearts and ears as possible to share her passion and appreciation for jazz on a global level. 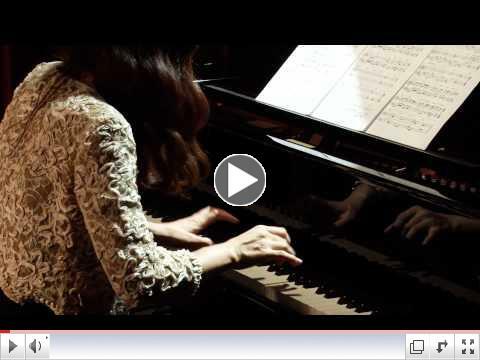 Click the video on the left side to view kpop star BoA's song 'Romance' arranged by Youngjoo Song. EnoB News - New Office! 이노비가 새로운 보금자리를 마련했습니다! 기존 사무실과 같은 건물이지만 층을 옮겨 넓은 곳으로 이사했답니다. 새로운 사무실, Suite# 400의 분위기를 살짝 보여 드리겠습니다. We recently moved to a bigger office in the same building. 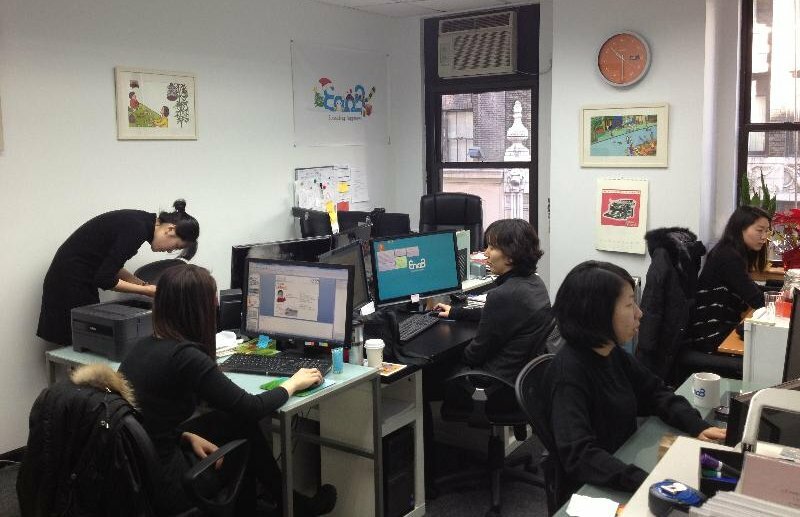 With more staff members in a new and spacious work place, we are now even more motivated and determined to thrive. We thank you again for your support and promise that we will continue our best to reach for a bigger dream. KRB 뉴욕 라디오코리아의 성유진이 만난 사람 코너에 이노비 강태욱 대표님이 출연, 라디오 전파를 통해 이노비를 널리 알렸습니다. 이노비의 뜻은? 이노비는 어떻게 시작되었나요? 이노비에서는 어떤 일을 하나요? 이노비에 참여할 수 있나요? 이런 질문에 대한 모든 답을 강태욱 대표님의 목소리로 들을 수 있는 라디오 방송을 다시 들으시려면 오른쪽 영상을 클릭해주세요! 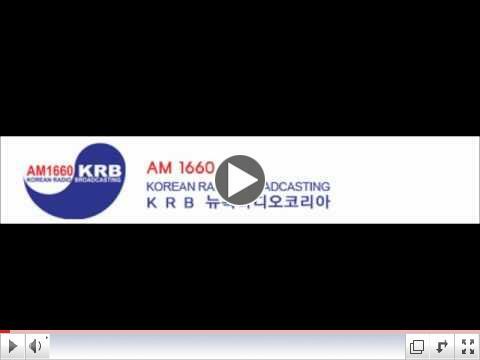 The Co-founder and President of EnoB, Taewook Kang, made a guest appearance on a KRB radio talk show on December 7th 2011. 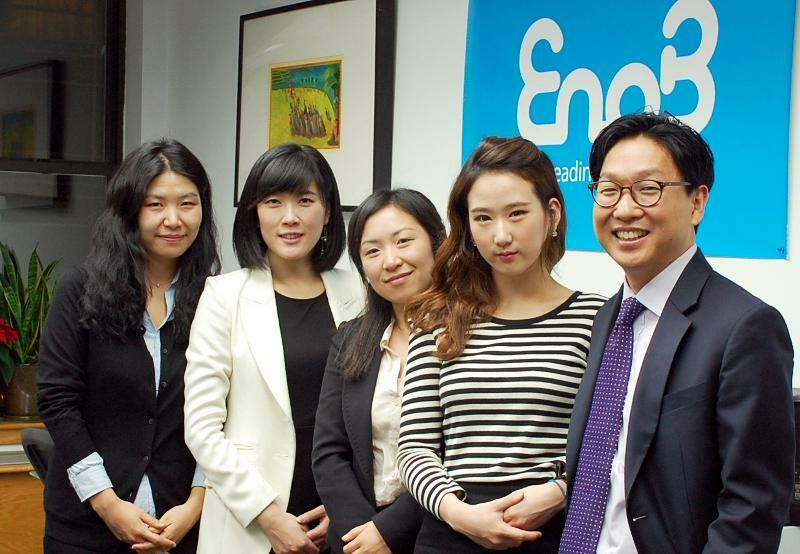 By answering a series of questions regarding EnoB's vision and its activities, Mr. Kang had a great opportunity to raise public awareness of EnoB. 아래 비디오를 클릭!하시면 EnoB의 지난 2011년의 모든 공연을 보실 수 있습니다. 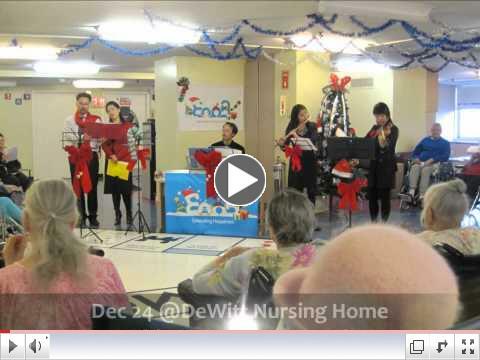 Click below to view EnoB's video footage from last year's concerts and events. 이노비 창립멤버 중에 한 분이시자 이노비 서울을 든든하게 지원해주시고 계시는 성기선 이사님을 소개합니다. 이노비 설립 때부터 지금까지 계속 이사로 참여하고 계시는 성기선님은 줄리아드 교수를 역임하신 지휘자시자 현재는 이화여대 음대 교수로 재직 중이십니다. 서울예고 재학 중이시던 1984년 서울시 청소년 교향악단을 세종문화회관에서 지휘하여 데뷔연주를 가진 이래 세계 유수의 저명한 교향악단과 국내 대부분의 주요 교향악단을 객원 지휘하셨습니다. 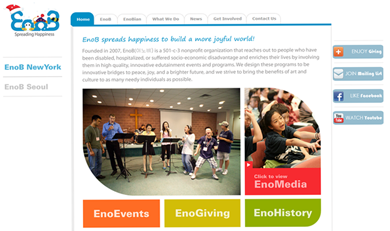 Conductor Ki-Sun Sung, one of our founding members, is a great supporter of EnoB. He is a professor at Ewha Womans University in Seoul, South Korea, and had also been a faculty member at the Julliard School from 2000 to 2006. 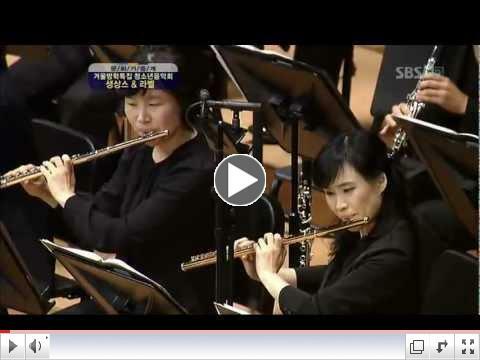 Since his formal conducting debut at age 17 with the Seoul Metropolitan Youth Orchestra, Ki-Sun Sung has guest conducted many orchestras and ensembles around the world, including with most of Korea's major orchestras. He says that 'he would be happy and fulfilled if he could himself continue growing in music, and especially help under-privileged people through his music'. 31th, Jan ,2012. Korean Art Centre Concert Hall, Seoul Korea. 2011 년 11월에 이노비에 새로 합류하신 이소영 이사님을 소개합니다. 이소영 이사님은 현재 Montclair State University에 가정아동학과 교수로 재직 중이시고, 서울대학교와 Virginia Polytechnic Institute에서 각각 학사와 석박사 과정을 마치셨습니다. 이소영 이사님은 평소 이민자 가족과 아동 문제에 관해 많은 관심을 두시고 연구를 해오셨으며, 가족과 어린아이들의 교육 그리고 가족에 미치는 지역사회의 영향 등에 특별한 관심을 두고 계십니다. 현 재 이노비 뉴욕의 회계를 맡고 계시고 지난 11월 열린 이노비의 기금마련 콘서트 때도 후원과 도움을 아끼지 않아 주신 이소영 이사님. 바쁘신 와중에서도 틈틈이 가장 적극적으로 이노비의 활동에 참여해주시고 계시고 또 나아가서는 전문분야를 살려 이노비의 프로그램 개발에 직접 참여하실 예정입니다. 앞으로 이노비가 나아갈 길에 이소영 이사님의 더욱더 아낌없는 격려와 조언, 부탁드립니다. Dr. 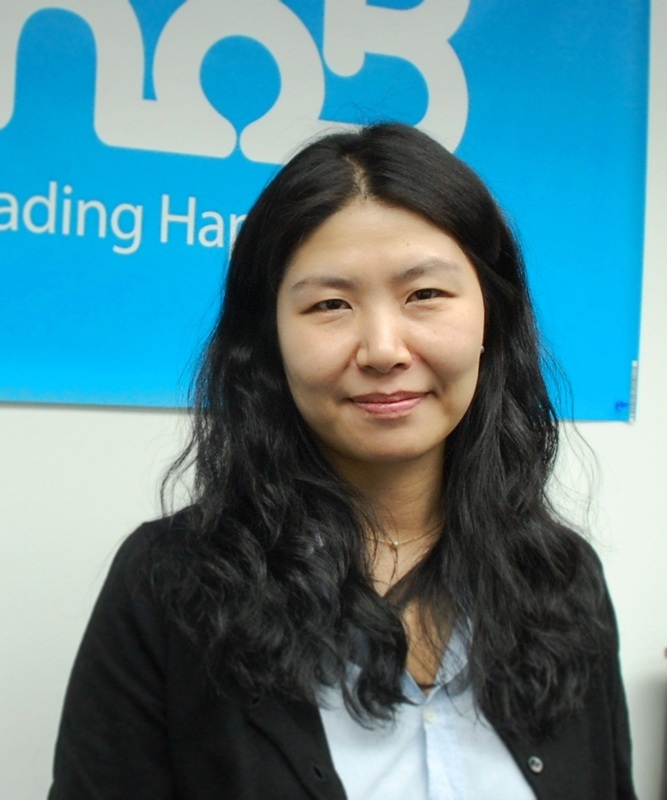 So Young Lee, who joined EnoB's Board in November 2011, is currently in the role of the treasurer for EnoB, New York. Dr. Lee is an assistant professor in the Family and Child Studies Department at Montclair State University. She obtained her degrees at Seoul National University and Virginia Polytechnic Institute. 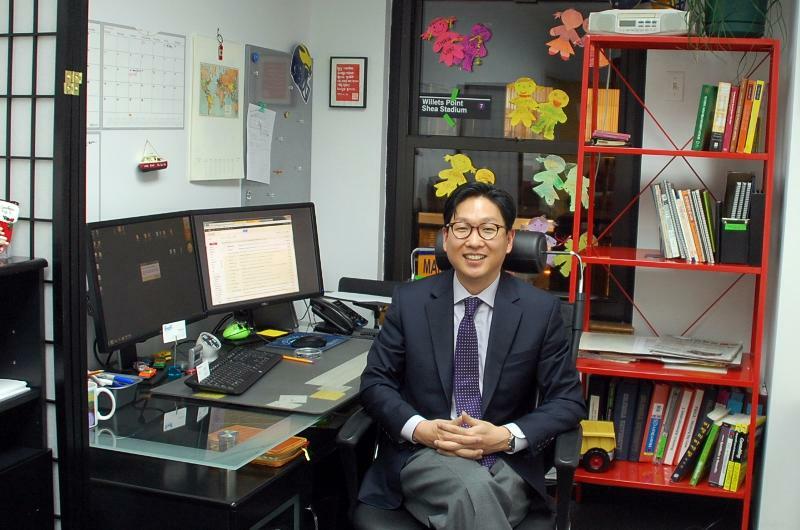 Dr. Lee's research interests include immigrant families, community impact on families, and young adult development. 이노비의 마케팅&어드민 디렉터로 역량을 발휘하고 계시는 김재연 디렉터님은 2010년 중국 북경대학 광화 관리학원에서 금융학을 전공하고 졸업한 후, 하바드 대학에서 비영리 기구 경영 분야 관련 과정을 수료했습니다. 중국과 미국, 한국을 오가며 다국적기업에서 마케팅 매니저로 근무하고 관련 분야 경험을 쌓다가 2011년 이노비에 합류하셨습니다. 공연 현장에서 웃으며 뛰어노는 아이들과 몸이 불편하신 분들이 이노비의 공연에 감동하시는 걸 직접 보고 느끼실 때 가장 보람을 느끼신다는 김재연 디렉터님께 이노비를 위해 앞으로 더욱더 힘을 써주시기를 부탁해 봅니다. Jae Yeon Kim graduated from Guanghua School of Management at Peking University in 2004, with a bachelor's degree in Finance. Ms. Kim then obtained a Certificate of Management at Harvard University where she focused on management studies for nonprofit organizations. She joined EnoB in 2011, bringing with her an extensive understanding of the field. Previously, Ms. Kim had also worked as a sales & marketing manager for a multinational corporation. 지 금의 이노비가 있기까지는 어린 새싹 같은 이노비를 따뜻한 햇살 같은 사랑으로 조금씩 자라도록 지켜주시고 도와주신 후원자분들이 있으십니다. 이번 호 이노진에서는 2007년 이노비의 첫 사업부터 큰 후원금을 쾌척해주시고 현재는 매달 정기적으로 소중한 재정지원으로 아낌없는 성원과 지원을 해주시고 있는 저희에겐 든든한 부모님 같은 존재이신 류정선(Chung S. Lee ), 이대수(Dae Soo Lee) 후원자님을 소개합니다. 이 대수 후원자님께서는 연세대학교 경영학과를 졸업하신 후 도미, 유학생활을 거치시고 대우 아메리카와 대우 유럽 총괄사장으로 근무하셨고, 유정선 후원자님께서는 이대 정외과를 졸업하시고 미국유학시절 남편이신 이대수님을 만나서 결혼, 두 자녀분을 훌륭히 키워내시고 현재 두 분은 남편분의 퇴임 이후 뉴저지 Saddle River에서 거주하시며 오랫동안 사랑해오신 오페라와 클래식음악과 발레 등의 문화생활을 틈틈이 즐기시고 있으십니다. 두 분께서는 좋은 것은 나눌수록 더 좋아진다고 하시며 음악으로 사랑을 나누려고 노력하는 저희에게 항상 격려의 말씀을 해주시곤 합니다. 평생 국회의원을 지내신 아버지와 삶이 곧 나눔 자체이시던 어머니께 많은 배움을 받아 꾸준히 나눔을 실천하고 계시는 유정선 후원자님과 미국유학시절 익명의 후원자 덕분에 무사히 공부를 마치실 수 있으신 후 도움은 우리 모두의 사명이라고 생각하시며 사랑과 베풂을 몸소 실천하시고 계시는 이대수 후원자님. 두 분은 모교인 연세대학교와 이화여자대학교에 장학금을 기부하고 계시고 꾸준히 교회지원과 선교비 후원을 하시며 이노비를 비롯한 비영리 단체에 지원도 하시고 계십니다. 이 자리를 빌려 다시 한번 이대수, 류정선 후원자님의 소중한 후원과 크나큰 사랑을 감사드리며 두 분의 삶을 본받아 저희도 세상에 더 큰 행복을 전하는 일을 실천하겠습니다. The EnoB family would like to recognize Mr. and Mrs. Dae Soo and Chung S .Lee, who have been two of EnoB's major supporters since 2007. After graduating from Yonsei University School of Business in Seoul, South Korea, Mr. Lee studied in the United States as well. He was the President and Chief Executive Officer of the American and the European subsidiaries of Daewoo International Corporation before retiring. Mrs. Lee graduated from Ehwa Womans University in Seoul, South Korea, and then continued further studies in the United States. She met her husband during her studies, and later raised two beautiful children. 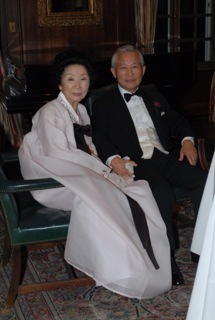 Mr. and Mrs. Lee now live in Saddle River, N.J., and are spending their free time enjoying classical music and ballet. They frequently encourage us by saying, "the more you share something the better it gets". Both of our patrons have backgrounds that helped foster their mutual philanthropic desires. 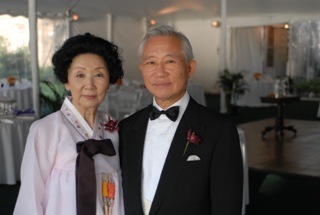 Mrs. Lee's father served as a congressman in South Korea, and her mother was well known there for her generosity. Because Mr. Lee was able to complete his studies in the United States with the help of an anonymous patron, he felt that it was his own fate and responsibility to support other students and people in need. They have been making regular contributions to their respective alma maters, as well as to churches and nonprofit organizations like EnoB. We thank Mr. and Mrs. Lee again for their continued generosity, and promise to better serve the community honoring their philanthropic spirit. 중 앙대학교 경영학과에 재학중인 고운정양과 같은 학교 국제관계학과에 재학중인 장명서 양은 7주간 이노비에서 인턴으로 근무하며, 한편으로는 뉴요커의 삶도 체험하고 있습니다. 7주의 시간이 헛되지 않도록 Intern에게도 각각의 project가 주어졌습니다. 각자 맡은 project를 staff 앞에서 발표하는 긴장되는 시간도 있습니다. 이노비에서의 경험이 앞으로 인턴들이 나아갈 미래에 값지게 쓰이길 바라는 마음입니다. :) 화이팅! 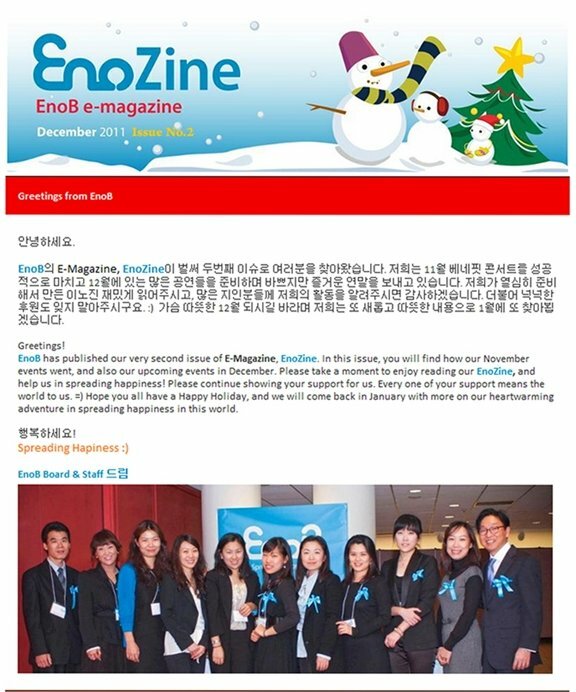 Unjung Ko and Myeongseo Jang are now working as interns at EnoB. They are both excited about the opportunity to work and enjoy life in New York City. Each has been given a specific project to work on during their 7-week internship at EnoB. The Beautiful Companion - Corporations 아름다운 동행 - 사회적 기업 It's a Wig! 이노진에서는 이번 호부터 이노비를 후원 해주시는 기업과 단체를 여러분께 소개해 드리고자 합니다. 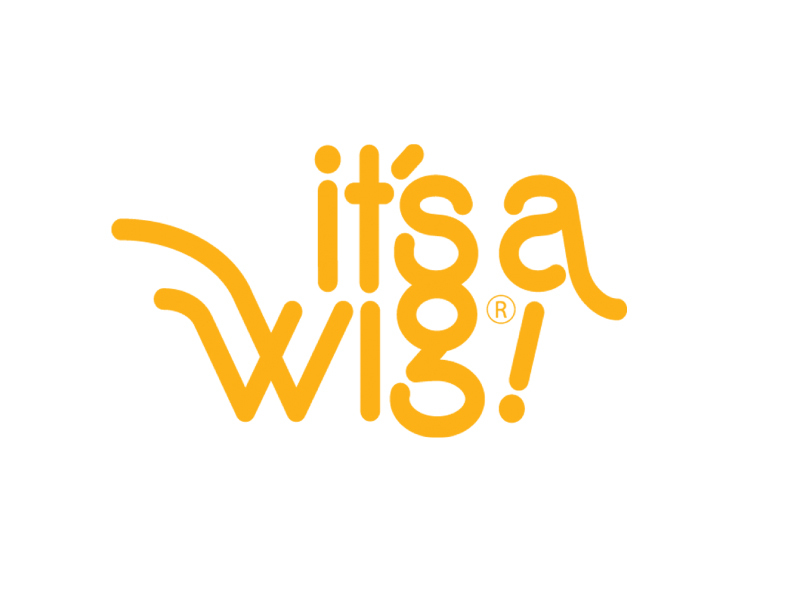 그 첫 번째 기업은 It's a Wig! 입니다. 평소 기업의 사회적 책임과 공헌에 많은 관심이 있으신 박철균 사장님 산하로 운영 중인 It's a Wig은 작년 이노비의 암환자를 위한 음악회 때 처음 후원을 해주신 것을 시작으로 올해 추진 예정인 콜럼비아대학 소아 병동 음악회와 미국암협회와의 음악회 때에도 후원과 환자용 가발 무료후원을 약속해 주셨습니다. 보통 사람들이 하고 싶어도 이런저런 이유로 못하는 일을 이노비가 도맡아 해줘 감사하시다며 격려 말씀을 해주십니다. 앞으로 이노비는 사회적 기업인 It's a Wig! 의 후원으로 더 많은 곳으로 사랑을 나누겠습니다! Our feature contributor in this issue is It's a Wig!, one of the world's leading importers and wholesalers of designer wigs. President Chul K. Park, who believes in corporate responsibility and social contribution, has generously promised financial support as well as free wigs for cancer patients attending EnoB's concert programs (to be held in collaboration with the Morgan Stanley Children's Hospital at Columbia University Medical Center and the American Cancer Society). 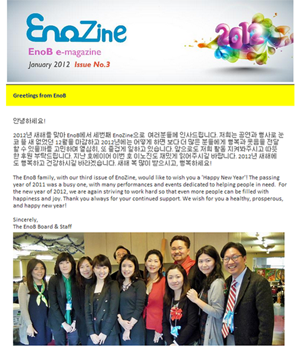 Mr. Park's has been a significant contributor to EnoB since last year, and yet he humbly gives credit to all of us for doing things that he himself would find difficult to do alone. We thank him again for his continued support and encouragement. 2 월 25일에 퀸즈에 위치한 Bowne Community Church (예람교회)에서 미국 암협회 퀸즈 지부와 함께하는 이노비의 암환자를 위한 콘서트 프로그램 Joy & Comfort Through Music이 열립니다.